With about 1000 very ancient trees Sherwood Forest has one of the most important concentrations of these gnarled majestic survivor’s in Europe. The UK has the largest concentration of ancient trees in Northern Europe. An oak spends 300 years growing, 300 years resting and 300 years declining gracefully. Trees shrink as they become ancient, becoming shorter and squatter. It’s a great survival strategy as it means they can cope better with high winds. A hollow tree is often a healthy strong tree. The decaying wood produced as it hollows acts as extra food for the tree which might even send down aerial roots inside the hollow to make the most of the rich picking. 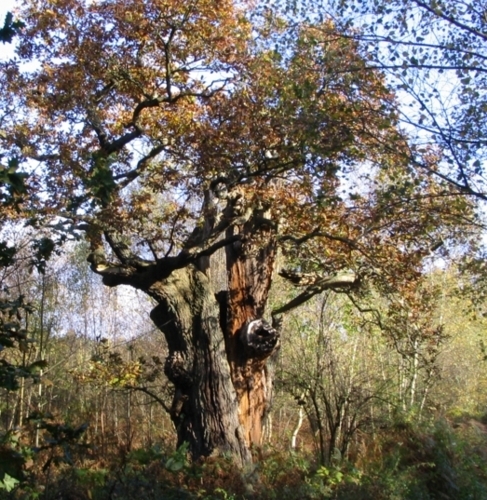 The largest ancient oak in the Sherwood, this famous tree is named after Major Hayman Rooke, antiquarian and archeologist, who made the first surveys of ancient trees in Sherwood in the last quarter of the 18th century. 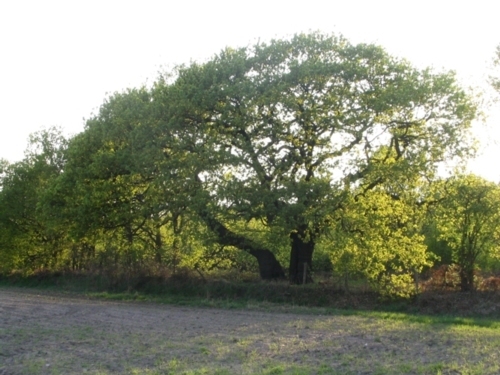 The tree , previously known as the Cockpen or Queen Oak, was named after Major Rooke who took an eight mile daily walk to the tree from his home Mansfield Woodhouse. A lot of pictures here and a website about the Major Oak. About 1100 years old it is the forest’s oldest surviving tree. Robin Hood and his men could certainly have sheltered under its spreading branches in its prime. The picture on the left shows that it was already very old by 1790. Since then the tree has regenerated itself with two smaller branches forming two new trucks so the boundary now passes between them. This phoenix process is not uncommon with the very old oaks in the Sherwood. Churn Oak and other Clipstone Hunting Park trees. Like the Parliament Oak, this was one of the original boundary trees of the Clipstone Park, the royal hunting park attached to King John’s Palace, enclosed in 1180. It is thought that it gets its name from Church Oak as nonconformists used it as an outside meeting place. It is another example of a very old tree regenerating itself with new trunks. This part of the Sherwood has the heaviest concentration of ancient trees, many of them now dead but still providing essential food and shelter for a whole range of specialist animals and fungi. This tree was so large that in 1724 the First Duke of Portland had a carriage road through it to win a bet. 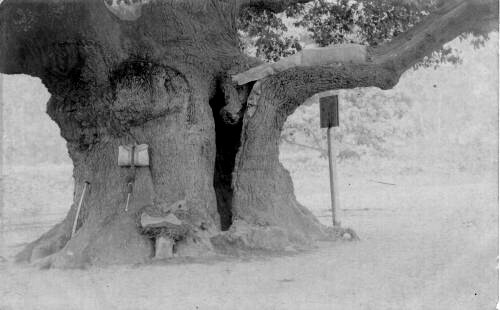 Hooks had been driven into the inside of the huge hollow trunk of this oak. It was associated with butchery but legend has it that Robin Hood and his band hung plundered venison in it. Like a number of these ancient trees, it was killed in 1913 when picknicers lit a fire inside it, finally blowing down in 1962.